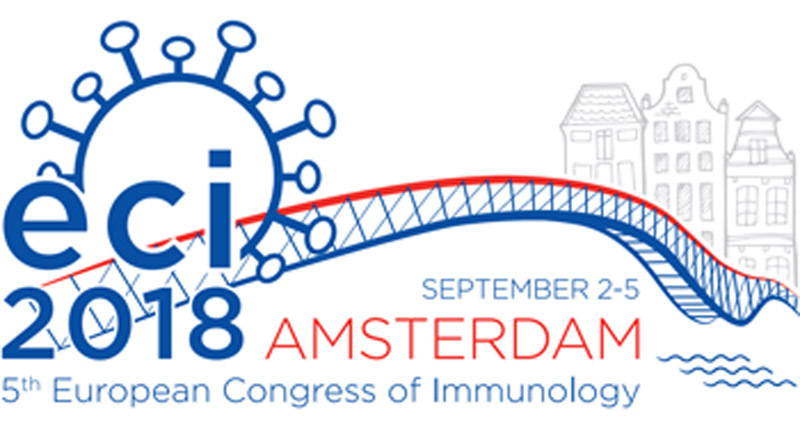 The Congress of the European Federation of Immunological Societies (EFIS) was held in Amsterdam (Netherlands) at the modern congress center “Amsterdam RAI Exhibition and Convention Center” on 2-5 September 2018. 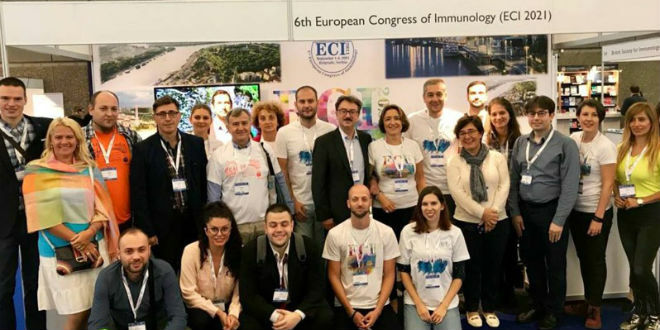 The European Congress of Immunologists in 2018 is one of the largest immunology congresses in the world with more than 3,000 participants. 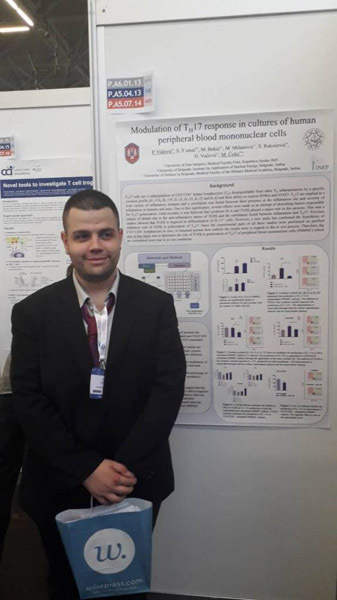 The scientific program has been focused on five major areas of immunology: 1. Immune Development and Differentiation, 2. 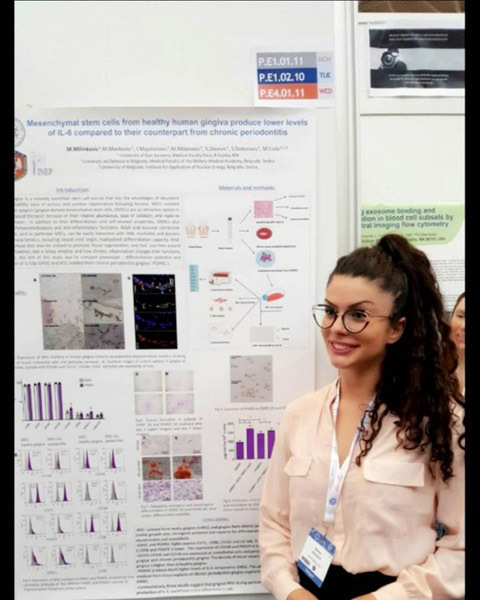 Tumor Immunology and Therapy, 3. Autoimmunity, Allergy and Transplantation, 4. Infection and Microbiological Immune Regulation, and 5. Immune-Economics – Technological Progress and Processing of Large Number of Data ‘. 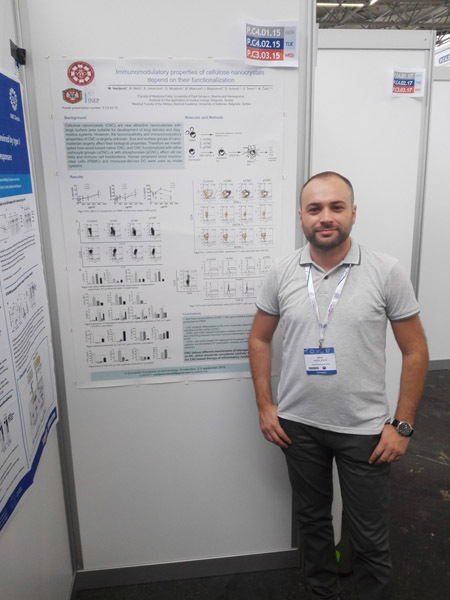 New guidelines were promoted at the Congress. There were more than 300 expert sessions and more than 2,500 abstracts that contributed to the advancement of immunology around the world. 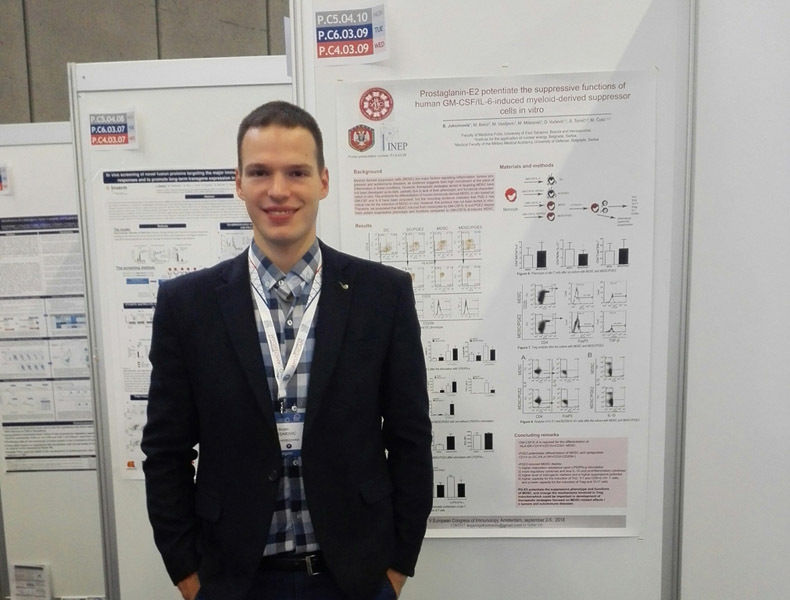 Prostaglanin-E2 potentiate the suppressive functions of human GM-CSF/IL-6-induced myeloid-derived suppressor cells in vitro. Joksimovic1, M. Bekic2, M. Vasiljevic1, M. Milanovic3, D. Vucevic3, S. Tomic2, M. Colic,1,2,3. 1Medical Faculty Foca, University of East Sarajevo, Foca, Bosnia and Herzegovina, 2Institute for the Application of Nuclear Energy, Belgrade, Serbia, 3Medical Faculty of the Military Medical Academy, University of Defence, Belgrade, Serbia. Vasiljevic1, M. Bekic2, B. Joksimovic1, D. Mihajlovic3, M. Milanovic3, I. Majstorovic3, D. Vucevic3, S. Tomic2, M. Colic1,2,3. Milinković1, M. Markovic2, I. Majstorovic2, M. Milanovic2, S. Zečević1, S. Todorovic1, M. Colic1,2,3. 1University of East Sarajevo, Medical Faculty Foca, R.Srpska, BiH, Foca, Bosnia and Herzegovina, 2University od Defence in Belgrade, Medical Faculty of the Military Medical Academy, Belgrade, Serbia, Belgrade, Serbia, 3Institute for Application of Nuclear Energy, Belgrade, Serbi, Belgrade, Serbia. Vidović1, S. Tomić3, M. Bekić3, M. Milanovic2, S. Rakočević1, D. Vučević2, M. Čolić1,2,3 1University of East Sarajevo, Medical Faculty in Foca, Foča, Bosnia and Herzegovina, 2University of Defense in Belgrade, Medical Faculty of the Military Medical Academy, Belgrade, Serbia, 3Institute for Application of Nuclear Energy, Belgrade, Serbia.